and never undercharge again with Cost A Cake Pro. 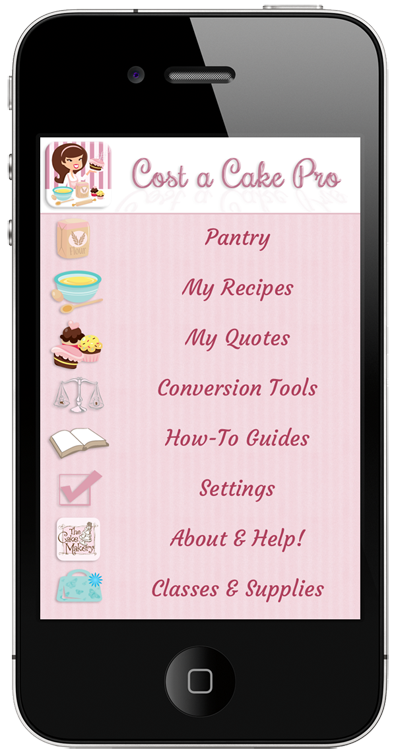 Cost A Cake Pro has been designed with ease of use and flexibility in creating your recipes and quotes. The Pantry is where you store all your ingredients, you enter the amount you paid and the pack size, and Cost A Cake Pro will do the rest for you!. Your Pantry also has an area where you can store all your extras. This can be anything from cake boards and boxes, to ribbon baking paper and delivery charges, anything that has a cost to it can be added. Once your pantry is set up, you can create your own recipes using any of the ingredients that you have stored. Your recipes are saved as you add the ingredients to them, and is there for you to use whenever you need to build a quick quote for an order, or if you are just interested to see how much the apple crumble you make regularly actually costs! The quotes section allows you to build quick and accurate quotes of your recipes, extras, and time - giving you a total figure for your cakes with just a few clicks. A fully customisable pantry for Ingredients and a separate area for extras - add anything you want! Build your own recipes - if you can bake it, you can add it! it's not just cakes and cupcakes! How to Level a cake - we give not one, but two different ways to Level your cakes, both methods are very simple, and work every time. This section also gives instructions on how to fill your cake and crumb coating ready for covering with sugarpaste. Working with sugarpaste - do you get confused with all the different 'paste' terminology? From sugarpaste to modelling paste, flowerpaste or is it gumpaste? What are they all and which one should I use? We also tell you how to make your own modelling paste, and give you tips on colouring your paste too.